There is no clinical history recorded. The specimen consists of the hilum and lungs of an infant. In the lower lobe of the left lung on its medial aspect there is a caseous focus, the Ghon focus. There is prominent caseation of the draining tracheobronchial and mediastinal nodes. 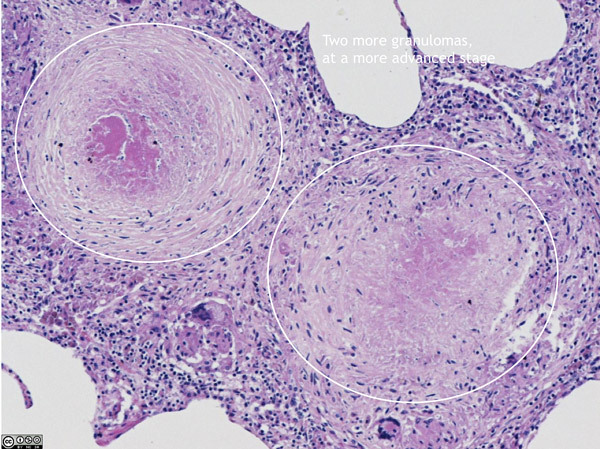 The Ghon focus in the lung together with the involved hilar nodes form the ‘primary complex’ or Ghon complex. The Ghon focus typically occurs in lower part of an upper lobe or upper part of a lower lobe, and is usually subpleural. The subpleural lesion quite often causes a small pleural effusion. The immune response to TB infection is primarily cell mediated and comes at the cost of “hypersensitivity” to mycobacterial antigens which causes caseating granulomas and ultimately tissue destruction. Most cases of primary tuberculosis heal at this stage, leaving a small fibrocalcific scar in the lung, sometimes visible on x-ray. Viable organisms may remain dormant in this lesion for decades. In children (< 2 years) the primary complex may not be contained. Rupture into a bronchus can cause tuberculous bronchopneumonia or haematogenous dissemination can cause miliary tuberculosis. 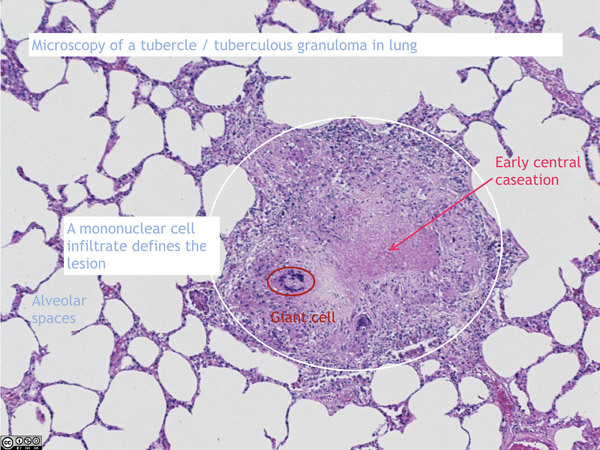 In some persons (usually immunocompromised) primary tuberculosis may immediately progress as “progressive primary tuberculosis”; in the lungs this may be radiologically indistinguishable from reactivation tuberculosis .